You may be a candidate for Chiropractic care! For a free no-obligation consultation call 309-268-9000. Most people with carpal tunnel syndrome think they have a primary problem in the wrist. While the wrist and hand may be the site of most of your symptoms, the cause can lie elsewhere. 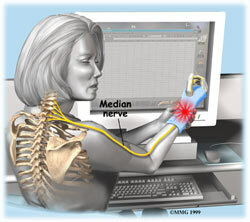 The nerves that course through the tiny tunnel in your wrist, originate in your neck. When the vertebrae are twisted in your neck or disk injury is present this can narrow the tunnels in your neck that the nerves must pass through. When this occurs and there is also a problem with compression at the wrist, it is called a double-crush syndrome. Double meaning the nerves are pinched at two locations. Researchers (Clin Neurol Neurosurg 2007; Oct.11; Moghaderi A, Izadi S) have looked at risk factors for the double crush syndrome. They specifically investigated age, gender, and body mass index (how heavy you are), as independent risk factors for double crush syndrome. One hundred forty-two patients (125 females) with carpal tunnel syndrome (CTS) and 109 controls/normal patients were analyzed. One hundred six patients had pure carpal tunnel syndrome and 36 patients had double-crush injuries. Patients with double-crush syndrome tended to be older. Greater age can have an influence on degeneration of the disks in the neck, which can lead to narrowing of the passages the nerves must course through as they exit the spinal cord and move down the arm. Male patients were also more likely to have double-crush syndrome. Since double-crush syndrome can be missed if a thorough neck examination is not done, this could lead to inappropriate treatments because the cause is not being addressed. Chiropractic care focuses on the cause of diseases. Just as a leg pain (e.g. sciatica) usually comes from a lower back problem rather than the leg itself, a wrist problem is not always in the wrist. It’s important to have a comprehensive assessment when carpal tunnel symptoms develop, and this may include x-rays of your neck. Our clinic tries to address these problems in a holistic, non-drug and non-surgical manner. Our approach will usually involve vertebral adjustments to correct structural problems in the neck region, if these are present. Consider chiropractic care as a conservative option prior to undergoing invasive surgery. This entry was posted in Uncategorized and tagged Advil, allied, allied health, allied health group, Alternative, american chiropractic association, Analgesic, Back pain, Body mass index, Carpal tunnel syndrome, Central nervous system, Chiropractic, Conditions and Diseases, CTS, Double-Crush Syndrome, Innate intelligence, Medical Specialties, Neck pain, Neurological disorder, Neurological Disorders, Patient, Physical exercise, Physical therapy, research, soft tissue structures, Wrist. Bookmark the permalink.